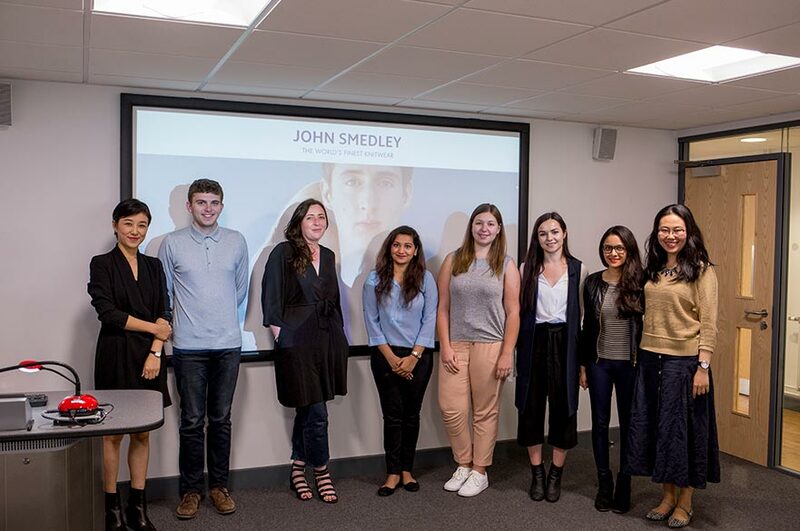 Three MA Fashion Management, Marketing and Communication students have each secured a one-month internship with John Smedley, following an exclusive live project. Established in 1784, John Smedley continues to be one of Britain’s most famous clothing brands, and is renowned throughout the world as a leader in the production of fine gauge knitwear products. Working in a group of six, the students were given a brief to devise a marketing strategy to champion ‘Britishness’ as a fully integrated marketing campaign for the brand. They had to examine all aspects of the organisation’s marketing mix; from product design through to every consumer touch point. The research focused on three key markets for John Smedley – the UK, USA, and Asia. Each team member researched specific areas according to their subject specialism and prior experience, and then collectively produced a set of proposals for the brand. As part of the project, the team were invited to visit the John Smedley factory and head office at Lea Mills, and two retail stores in central London, and individual team members also undertook research in Paris and Antwerp during their course field trips. Jess McGuire-Dudley, John Smedley’s Marketing & Design Director, was so pleased with the team’s work that she offered three of them internships. She told us: “The group generated a whole host of impressive and highly diligent research, and creative ideas. They understood our brand values, and how to transition these to a new, more contemporary audience. No easy feat when you are balancing more than 230 years of heritage with the wants and needs of the modern consumer. The students will work together at the head office in Derbyshire during their internship to write, direct and produce a short film. The idea for the film was conceived by the team as part of the proposals they produced for the live project. All members of the team have also been given tickets to their fashion show in London in July. Selected students Juan Sun, Emma Stoner, and Samantha Hess were thrilled with the opportunity to work for a renowned brand. Alex Hanford, Senior Lecturer in Fashion Management, Marketing and Communication commented: "The live project with John Smedley gave our students the opportunity to see first-hand how a professional marketing team work, and the complexities of creating marketing concepts and events for an international consumer.